The Refined Geek » Dear Esther: A Game It Is And So Shall It Be Judged. Dear Esther: A Game It Is And So Shall It Be Judged. Recent years have seen the lines of what defines a game blurred significantly. Games like Heavy Rain eschew normal game mechanics in favour of only minimal interactivity, instead focusing very heavily on the story. Most gamers called titles like these playable movies or cinematic gaming (although the later is now more often used for big budget titles that have a movie feel about them) in order to set them apart from their more traditional gaming ancestors. Dear Esther is another one of these such games, being re-released as a stand alone game after it enjoyed some mild success back as a source engine mod. The game made waves as it recouped its cost in no less than 5 hours after going on sale and with the usual friend recommendation I thought it would be worth a shot. Dear Esther drops you on an unnamed island, put in charge of an unnamed person. As you move through the world a narrator reads sections of dialog describing one of 3 separate story lines. There’s really no driving goal, the narrator doesn’t prompt you to move anywhere, but there’s enough clues to show that you’re pointing in the right direction. There are no puzzles to solve, no enemies to defeat, you must simply keep progressing forward as the narrator reads and you explore the island. 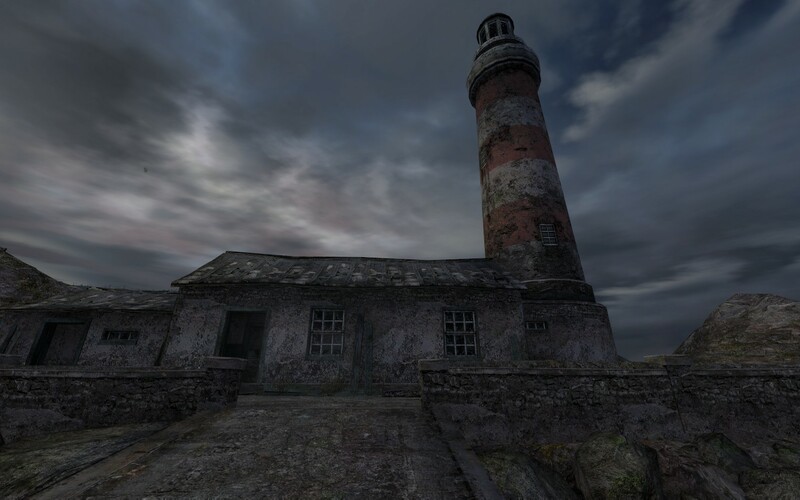 Graphically Dear Esther isn’t that impressive, mostly due to its source engine roots. Whilst there are some scenes that are quite beautifully created the rest of the game is ridden with over-specularity that makes the objects appear fake. It’s not exactly terrible though as there’s really not that much you can do with a long deserted island to make it visually interesting so overall the graphics are passable but nothing really spectacular. Now this is where I’d usually start talking about the game play, but there’s really nothing more to say about it. All you do is walk around, look at things and have the narrator read passages to you. There’s no sprint button so you’re stuck walking at the exact same speed every time and the only real secret to the game play is to try and find all the places that you can walk to as the majority of them will trigger another dialogue section. However doing that is not an exact science either as there are many sections that look like they’re inviting you to come down there for another piece of dialogue when in fact there’s nothing there at all. This wouldn’t be so bad but the achingly slow pace at which the main character walks means that what looks like a short trip can take you several minutes to accomplish. When there’s nothing else to do but walk and hope that the narrator starts talking again this gets quite laborious to the point where I just stopped trying. What’s worse is that if you do play Dear Esther as a game by say trying to decipher the all the clues that are seemingly littered around the place you’re in fact just wasting your time. Sure they tie into the story somewhat but there’s no rhyme or reason to them, they are just there to break the game up visually. Indeed without them you’d spend long sections looking at nothing but varying shades of brown, green and grey. Even then though after seeing the same pattern repeated over and over again they don’t really even serve that purpose, instead just blending into the background as noise. All of this then combines into an experience that is, for what its worth, completely and utterly boring. There’s really nothing interesting about the experience at all as the jumbled story (done deliberately, apparently) slow pace and so-so visuals do nothing to inspire enjoyment on any sort of level. It got so boring that at a certain point, where a giant hole in the ground is presented to you, I threw my character in there in the hopes something interesting would happen. Instead I was just catapulted back a couple minutes which just extended the painful time I had to spend with Dear Esther. Reading other people’s experiences had me questioning whether it was fair to judge Dear Esther based on its merits as a game. Indeed nearly all traditional elements that we’ve come to expect from a game have been stripped away from Dear Esther, even further than that of any of the playable movies that have been released to date. Judging Dear Esther as a game then would seem unfair as it’s more akin to a strange kind of performance art than anything else. The thing is though Dear Esther is sold as a game on a platform that deals exclusively in games. It has the same controls as a game, for the most part, and is being talked about almost exclusively by the gaming community. Judging it on its merits as a game then seems fair to me as whilst it might be far removed from even its closest cousins to completely exclude it from that genre is to ignore some of the core aspects which constitutes a game. As a game then Dear Esther is astonishingly terrible in every regard. It’s (thankfully) very short with my play clocking in at just over an hour and the longest plays barely touching 2. The graphics, whilst capable of producing some decent set pieces like that shown above, are nothing spectular and above all the game play is simply non-existent. Even forgetting for a second that the lack of game play is intentional the story, which is what should carry a game in absence of game play, is boring and uninspired. I felt nothing for any of the characters in any of the stories and the whole idea of giving you random sections of the story so you have to draw your own conclusions is a hacky way of trying to make each game play unique. Dear Esther then fails to entertain as a game, as an art piece or whatever it set out to be. The added insult is that I paid $10 for the experience, a price which has netted me other titles like Cave Story+ that managed to not only entertain me but also did so for more than an hour. Based on this I can’t really recommend Dear Esther to anyone unless you feel the need to torture yourself with a slow moving game that will ultimately leave you unsatisfied. Dear Esther is available on Steam right now for $10. Game was played entirely on the PC with a total of 63 minutes played. Not really a very good review is it? Not sure how you can call it ‘boring’ either – the vast majority of reviewers and players love it. I think it’s excellent. Not really a good comment is it? My experience was one of boredom and I know that puts me in the minority, but that’s just it: It was my experience. Telling me that everyone else enjoyed it won’t suddenly change the experience I had with Dear Esther. Sure I might not be getting some aspect that’s apparent to everyone else, but realizing that won’t change that torturous hour I spent with it into some kind of amazing experience. Enlighten? I’m sorry but I’ve played many games where the game mechanics are either secondary to the story or simply non-existent and thoroughly enjoyed them. Just off the top of my head I can think of To The Moon, Gemini Rue and Heavy Rain. All those stories had something in them that made me feel for the characters, some to the point of leaving me an emotional wreck afterwards. Dear Esther’s story, with it’s random dialogue selection and thoroughly uninteresting story, failed to grab me in the same way. Sure you probably saw it differently and you’re welcome to write your own review, just as I did. I deliberately avoid reading other reviews prior to writing my own for the simple fact that doing so influences what I write. Still once its done and dusted I will go out and see what other people think and I am well aware that Dear Esther has done well with both professional and amateur critics alike. Does that mean I’ll change my review to be more like theirs? Never as to do so would show that I’m incapable of deciding my own opinion and, above all, not willing to defend it should it put me at odds with the majority. Hey John, I appreciate the mention! I’m originally the author of that Dear Esther “review” you linked, and I just want to say that I’ve moved back to my original blog, Volatile Mode. I’ll include the link: http://avideogamesblog.blogspot.com. As for the review, of course everyone is entitled to their opinion, but by judging Dear Esther as a “game” is perhaps the wrong viewpoint. It’s more an interactive movie, where the only interaction is walking the island. Personally, I watched it on YouTube, so maybe that adds to the experience, but everyone is different emotionally and will regard the “game” from a different perspective. What I will disagree with, though, is how this David (who I assume is the reviewer) assumes the story is lacking. It’s true the dialogue is scattered and randomly generated, but that’s to help the player come up with his or her own conclusion of what’s happened. As I said, DE plays like a movie and everyone will regard it differently, and the developer purposefully scattered dialogue to adhere to that. I did really enjoy reading this review, however. Hoped you liked mine in the process! Perhaps it is Jeff but it shares enough common ground with other titles in the same medium that I feel my classification of it is valid. Like I said before I’ve played many other games where the game play wasn’t the main draw card and still managed to love those. The story of Dear Esther simply didn’t have the impact on me that it did on other people. I might have enjoyed it more if the interactivity was stripped from it as that was definitely were a lot of my frustrations came from. I don’t mind a bit of mystery or making up my own conclusions but there was something about Dear Esther’s story that just didn’t do it for me. It’s possible that my play through lacked enough cohesion for me to appreciate the individual story threads, but since the majority of players seem to enjoy it that seems unlikely. I did enjoy your review and you picked up on one thing I forgot to mention: the soundtrack. That’s probably one of Dear Esther’s more redeeming features which was unfortunately overshadowed by everything else in the game, for me at least. Pingback: The Refined Geek » Journal: An Emotional Coming of Age. Pingback: The Refined Geek » FRACT OSC: From Silence to Serenity. Pingback: The Refined Geek » The Old City: Leviathan: How Can You be Certain? Pingback: The Refined Geek » Journey: Beautiful, Joyous, Compelling.